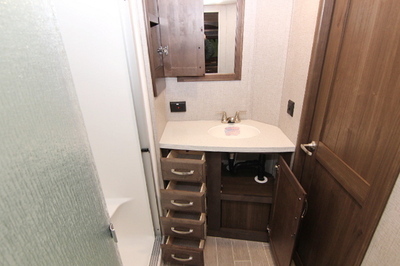 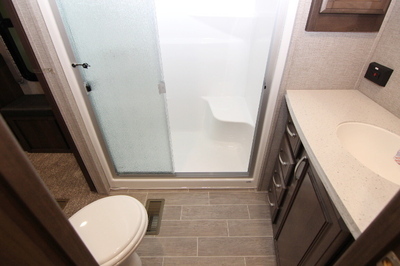 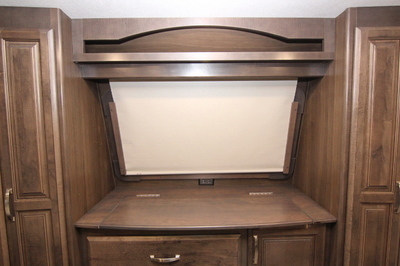 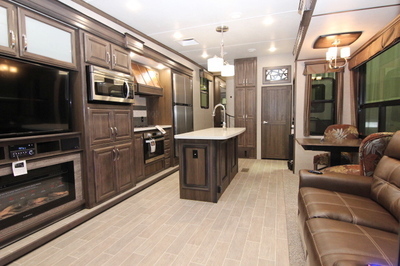 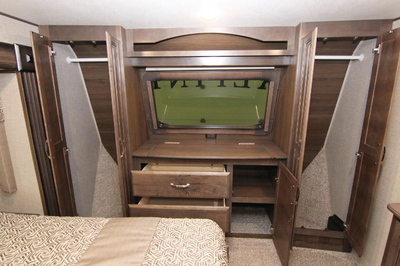 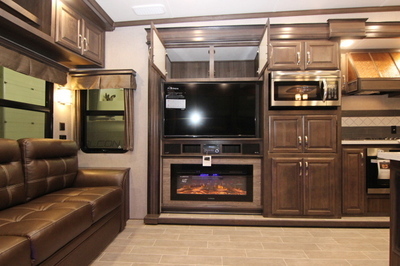 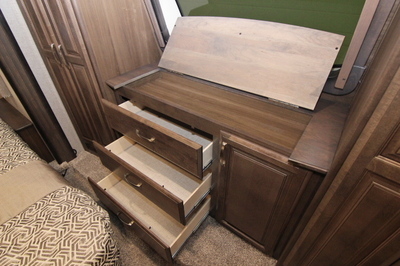 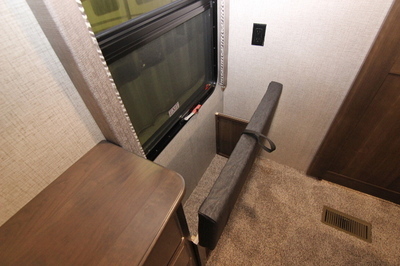 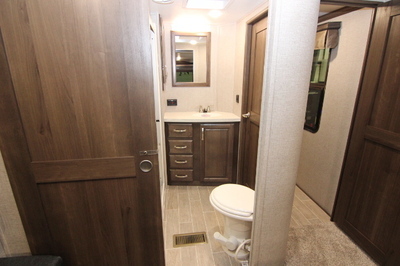 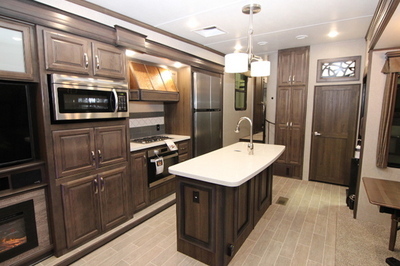 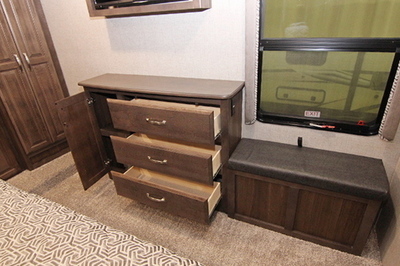 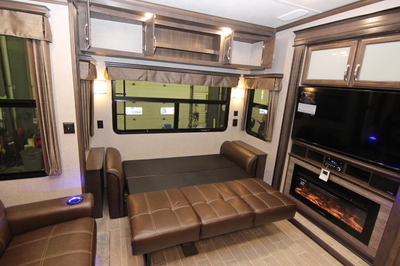 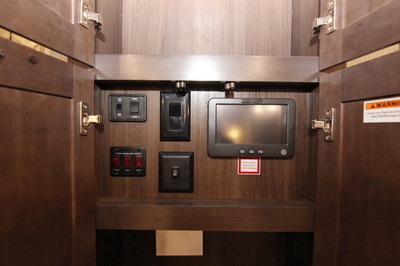 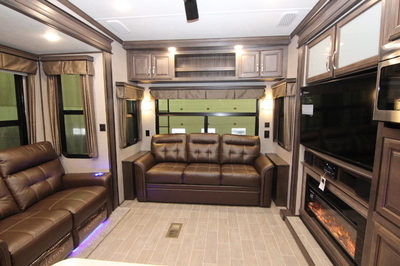 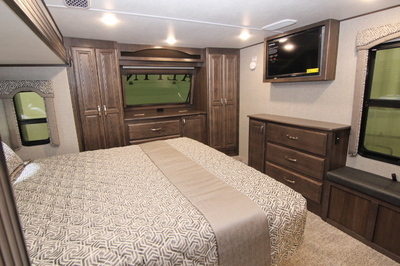 Packages and Upgrades Included with this Unit:- Alps Package, Whisper Air Deluxe (Dual 15K), iN Command Smart Automation System, G-Range Tires, 18 Cu Ft Four Door Fridge, Central vacuum, Trail Air Pin box, Heat Pump, 6 Point Hydraulic Auto Leveling, Free Standing Dinette and Chairs. 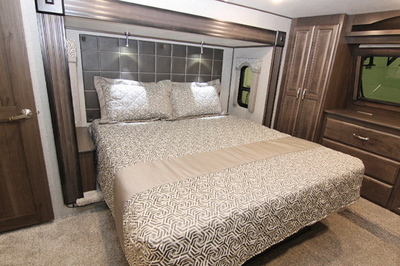 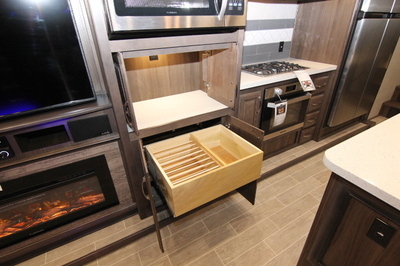 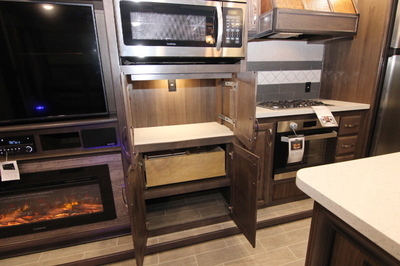 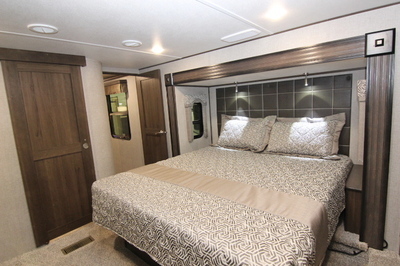 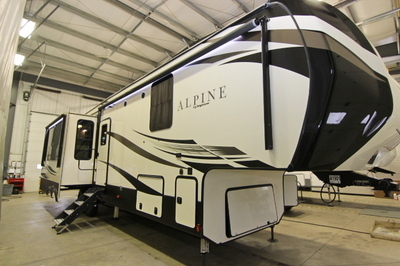 Alps Package:- Furrion RV Chef Kitchen, Oven and Cook-Top, 12 Volt Heat Pads on all Tanks, Heated Basement, Insulated Tanks, Bus Style Slam Baggage Doors, High Gloss Oyster Exterior, Road Armor Suspension, 12” I-Beam Drop Frame with Massive Storage, Whisper Quiet Air Conditioning System, Heat Pump, Digital “Smart” Programmable Thermostat with Dual Zone Capability, LG Solid Surface Kitchen and Bath Counter Tops, MCD Day/Night Roller Shades, Cherry Hardwood Cabinet Doors-Stiles-Fascia,Hidden Hinges Cedar Lined Wardrobe Closet, Washer and Dryer Prep, Wide Body Construction, Summit Slides with Oversized Windows, Residential Style Window Treatments, Custom Painted Front Cap with Clear Coat Finish, Furrion 50” TV,DVD Player with Blue Tooth Technology, Solar Panel Prep, Accessory Receiver hitch, LED Lighted Power Awning, Exterior Speakers, Bank-Up Camera Prep. 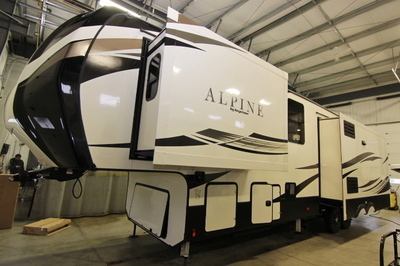 Exterior Features:- Rear Accessory Hitch, Solar Prep, Rear Observation Camera Prep, G Rated Tires, Heavy duty 7,000lb Axles, Easy Lube axles, 12'' Beams with Z-frame Technology,''No Sweat'' Vented Attic System, 50 AMP Service w/Detachable Power Cord,Hydraulic Selector Valves for Slideouts, Hydraulic Front Landing Jacks w/8”Diameter All-Terrain Landing Pads, Gutters w/Rain Spouts, Rear Ladder,One-Touch Electric Awning Package with Adjustable Arms, Tinted 80% Safety-Glass Windows, MAX TURN High-Gloss Fiberglass Front Cap and Rear with 30% Better Turning Radius, and an Aerodynamic Design w/18% Better Drag Efficiency and Hitch Assist Back up Mirror, High Gloss Exterior Sidewalls, Baggage Doors, and Entry Door,Class ''A'' Style Dual Latch “Slam” Baggage Doors, Super-Size 6’4'' Tall, 30'' Wide Entry Door, Deluxe Graphics Package, High Gloss Fiberglass Rear Cap (N/A 3700,3701, 3800, 3801). 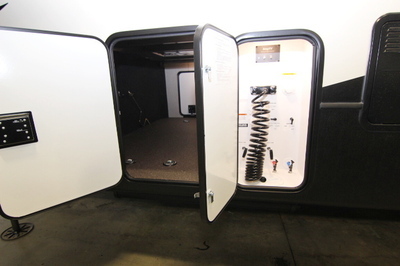 One Piece Polypropylene Underbelly. 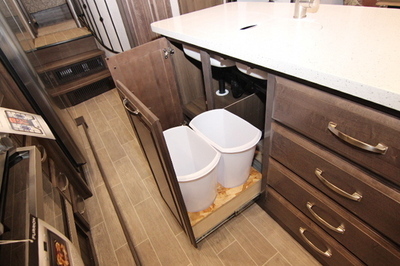 All-In-One “Waterworks” Exterior Utility Center Featuring:- Easy Siphon Winterization System, Water Heater Bypass, Enclosed Low Point Drain Valves, Ducted Heat for Cold Weather Protection, Dump Valves, 110V Outlet, Black Tank Spray Hookup. 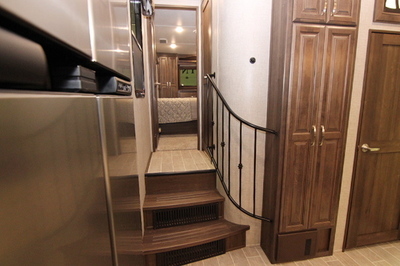 Suspension:- Improved Impact Absorption, Improved Axle Equalization, 8 Greasable Wet Bolts, Long Lasting ½” Steel Shackle Plates, Long Lasting Bronze Bushings. 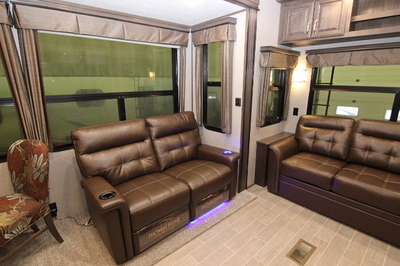 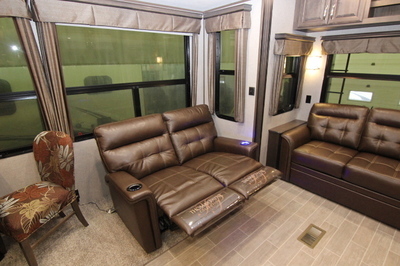 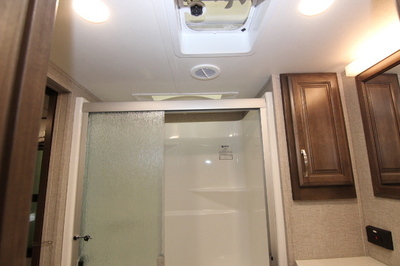 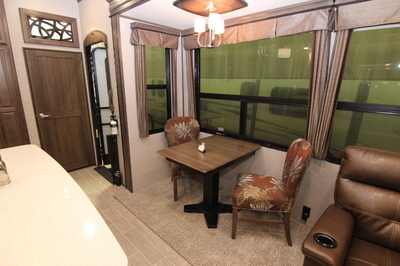 Interior Features:- Tri-Fold Sleeper Sofa, 2 High Back Custom dinette Chairs, Folding Chairs(2), Extra Tall 6’ 10” Main Slide Height, MCD Day/Night Roller Shades, Ceiling Fan, Electric Roof Vent in Kitchen, LP Leak Detector, Translucent Glass Shower Door & Enclosure, Hand Held Massaging Shower Head, Skylight Over Shower,Porcelain Toilet, Single Level Master Bedroom Suite, “Cloud Nine” 70” X 80”Pillow Top King Bed Mattress (Optional 3800, 3801), Residential Style Headboard with Shelves, Cross Ventilation Bedroom Windows where Available, Quilted Bedspread and Pillows. 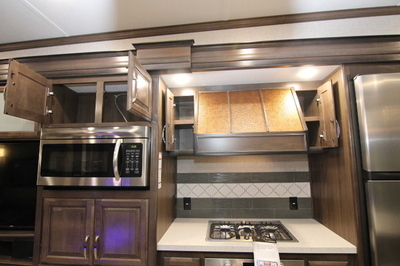 Upgraded Appliance Package:- Furrion RV Chef Collection Kitchen, 30” Convection Oven/Microwave, 12 Gallon DSI 2-Way Water Heater, 35,000 BTU Furnace (Most Models), Digital “Smart”Thermostat with Dual Zone Capability, Heavy Duty Residential Ball Bearing Drawer Guides, Extra Deep, Fully Extendable Drawers, Central Vacuum System. 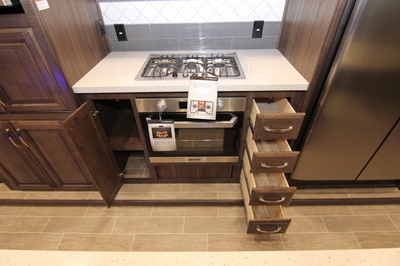 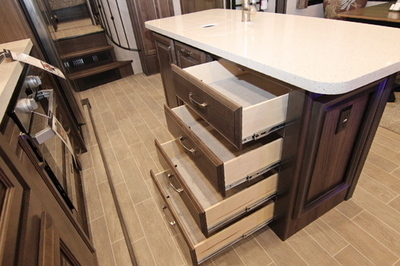 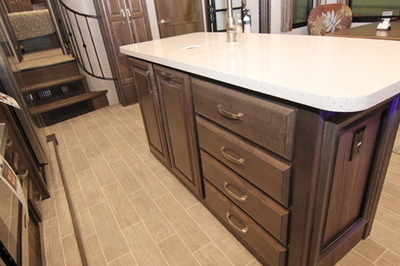 Deluxe Solid Surface Package:- Solid Surface Countertops, Solid Surface Sink Cover, Stainless Steel Extra Deep Sink with Dual Bowls, High Rise, Single Lever Kitchen Faucet with Sprayer, Maximized Kitchen Storage with More Drawers and Pantry Space. 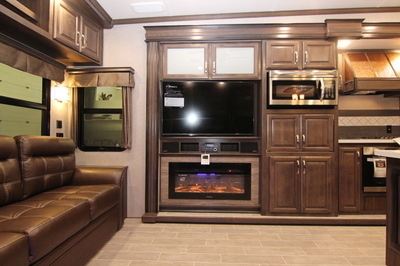 Super Cinema Package:- 50” LED TV, Furrion Sound System, Outside Speakers, Digital TV Antenna w/Built in Booster, Dual Cable & Satellite Hookups. 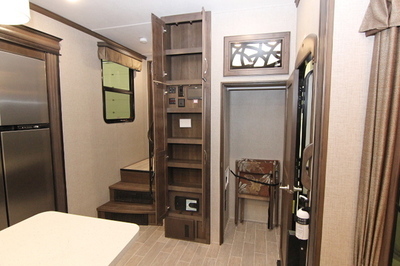 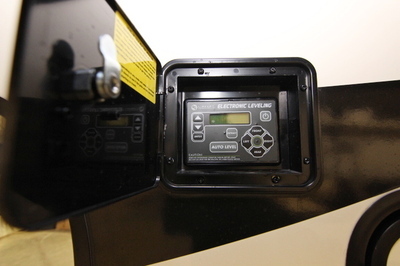 North Face Insulation Package:- Triple Insulated, Heated Basement, Heat Ducting to Tanks with Heated Padding, Heated “Water Works” Area, Rear Power Jacks, Hydraulic Front Jacks,High Gloss Sidewalls and Doors, Electric One-Touch Awning with LED Lights. 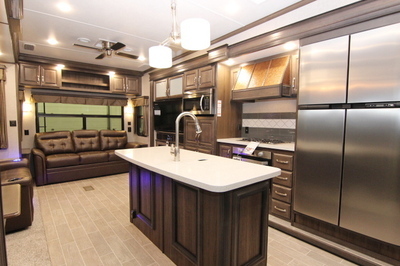 Whisper Air Bundle:- Two 15,000BTU Air Conditioners with Cold Ari Return Vents, Digital Smart Thermostat with Dual Zone Capability, One 16,500 BTU Heat Pump Standard, Fully Programmable Dual Zone Temperature Control.